I ran some patent numbers over the past week using the USPTO web search interface. It’s not the easiest search environment to use, and I don’t expect the numbers to be precise. But I expect the numbers are accurate enough to see major trends. The USPTO database populates most of fields starting in 1976, so that’s where I’ll start–though I’d love to have data starting in 1945. 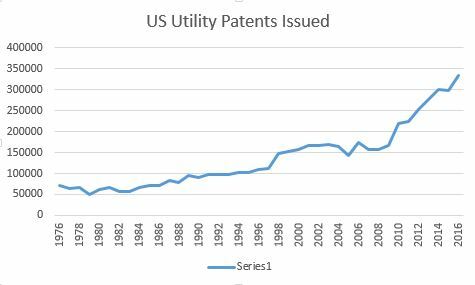 Since 1976, patenting has increased about 5x, from the mid 60,000s to the 330,000s of utility patents issued each year. Things are flat until about 1984, and then there’s a steady increase until then about 2009, and then a steeper increase. Since issued patents lag filings by about three years, we might look to 2006 or earlier for causes for the increase in the increase. 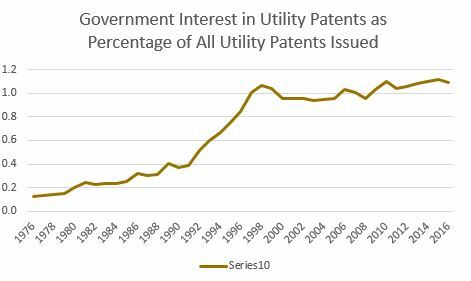 During the same period, utility patents issued to the federal government remained flat–while patenting generally was going up 5x, the federal government obtained about the same number of patents each year. 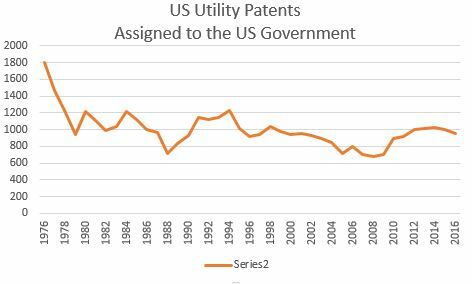 In 1976, the US government obtained about 2.6% of all utility patents issued. By 2016, that percentage had fallen below 0.3%–a nearly 10x drop in federal government representation. We might posit that the first big decline is the result of Bayh-Dole and the executive order in 1983 that expanded Bayh-Dole to all contractors. We might attribute the following rise to the Technology Transfer Act of 1986 that opened up more government patent activity for commercial licensing. But these are just provisional markers. Actual causes–especially where things get complicated–can be difficult to assign. Perhaps the federal government has become more selective in choosing what to seek patents on. Perhaps they have looked at the data and decided that patenting doesn’t do all that much to promote agency missions. Perhaps the rise of global trade has made it less attractive for the US government to take out monopoly positions that might block the import of worthwhile goods into the US. Or, perhaps, other players have substantially increased theirs–biotech and software inventions became patentable in the 1980s, along with business methods and the like, and the US market became a preferred target for foreign companies. There are plenty of possibilities–and a great many when one considers combinations of possibilities. 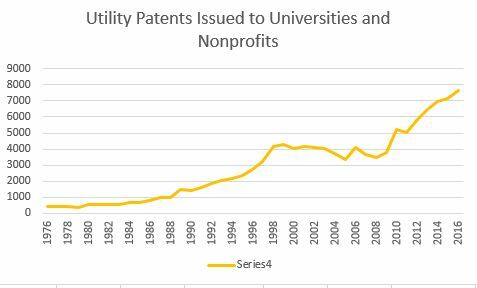 But the trend is clear enough–the US government share of issued patents is down by an order of magnitude in forty years. Increases in patent activity also might not signify anything with regard to “innovation productivity.” More patents could mean more money allocated for patents and less interest in using the public domain as a commons. And more patents could mean greater concern for dealing with competitive threats–and so, more participation in patent pools, standards, cross-licensing, and the like. Patents become a kind of currency to trade to gain access to a market that otherwise requires cash, and lots of it. It’s also possible that patent activity is up as a result of changed patenting strategies. An applicant might file a utility application with multiple inventions, and pursue these inventions with new divisional and continuation-in-part applications, and also file repeated continuations in order to edit claims. That activity will show up as multiple issued patents based on a single point of invention. We could be producing more relatively unimportant inventions, patenting more of them, and patting ourselves for how much more innovative we have got when we count patents. But how to know? Federal government patenting activity has been flat. Let’s look then at patents reciting government interest. These are patents held by contractors to the US government–for-profit and nonprofit alike. 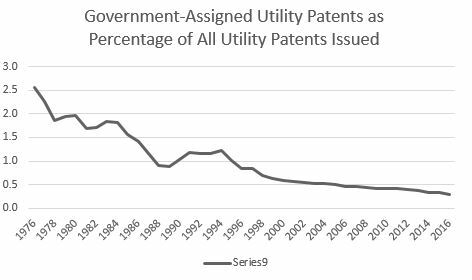 Here’s a graph of issued utility patents reciting government interest compared to the percentage of all utility patents issued. Government interest is up by a factor of 10. That’s remarkable, given the huge increase in patent activity overall. The greatest increase came in the period 1991 to 1997, and since then things have leveled off. Assuming a three-year lag between application and issue dates, we might look to 1988-1991 for clues, and for three to five years earlier if we think about areas of research that might result in inventions around 1988. Let’s look next at university patenting during this period. Getting at these numbers is a bit more difficult. Some universities don’t use “university” in their name–they are colleges or institutes, and some have changed their names over the years. Some universities work through affiliated foundations with various naming conventions. University medical centers and hospitals might file patent applications under their own names rather than using the name of the university they are affiliated with. And a number of inventions are jointly owned between a university and company, or multiple universities, or universities and institutes or federal labs run by universities or by companies set up by universities. So counts can be duplicated or patents show up that are already held as well by companies. I can’t hope to catch all of the variations here. These will be gross measures, nothing precise. For a long time, many universities worked through Research Corporation, so I have run some numbers for Research Corporation as well. There have been other patent management agents for universities–University Patents, for instance (222 patents between 1976 and 1997, or about 10 per year)–but I have not tried to be so comprehensive. Similarly, I have included foundations in my search–to capture all the various research foundations. But my search also captures any organization with “foundation” in its name, and this will skew the numbers. All these numbers are only gross measures. Patents can issue and later be assigned, and my search would not catch these things–so inventors could file on their own and later assign to their university or to a foundation. And if we wanted to get a measure of the output from university research expertise, looking at the assignees on issued patents would hardly get at all the patents obtained by faculty and other researchers outside the claims of university policies (which have varied widely, if not wildly, over the years). Especially interesting to get at would be inventions patented by faculty in consulting relationships, in collaboration with companies, and in startups after taking a license for a university invention. But those sorts of searches would require one to link up specific inventors with universities and then search for all their non-university patents. It can be done, but there’s a lot of work involved. For now, the idea is to look for changes in patenting activity and ask whether these changes represent trends and whether we can learn anything from the trends. Think, then, of these numbers as gross indices rather than as precise counts. I expect they are good within 10% or so (since I have run them with various search parameters and have seen how things have varied). Here we see a gentle, increasing slope with a sharp upturn from 1996 to 1998, then a leveling off until 2009, and another sharp increase. 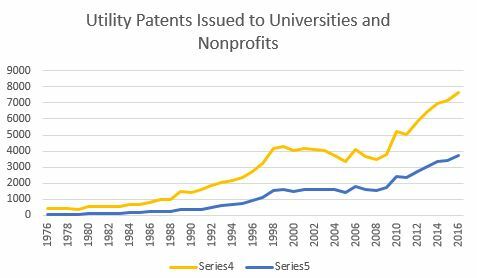 Overall, this university-foundation-nonprofit index has increased about 15x over the period covered, with something interesting happening around 2006 that results in an increase in the number of patents issuing three years or so later, and continuing to climb. But what? More money for patenting? Expansion of research funding in areas that are attractive to patents? Changes in patenting strategies? Less selectivity in what to patent? Expansion of university policy claims covering inventions made by university personnel? Plenty of possible drivers. Here’s a graph that shows total university and nonprofit patenting (gold) and the portion of that patenting that carries a government interest statement–reflecting a claim that the invention is a subject invention (blue). It is apparent that patenting of non-subject inventions is increasing at a higher pace than that of subject inventions. This appears to be the case for both the periods of rapid increase. But patenting on subject inventions held steady from 1998 to 2009, while patenting activity overall declined slightly. One might think, then, that there’s a possibility that overall patenting activity is not tightly coupled with federal research funding, or perhaps subject inventions are not as attractive for patenting as other inventions claimed by universities. This entry was posted in History, IP, Metrics. Bookmark the permalink.